Neer Nirmal Pariyojana (NNP), Assam has recently Published Recruitment Notification or an Employment News for the recruitment of 12 LDA, Office Assistant & Specialist Vacancies. Candidates who are eligible for this Recruitment & are Interested to Apply for this Posts those Eligible Aspirants Can Apply in Prescribed Application Format Before the Last Date 15.07.2017. It’s a Very Good Opportunity for all Government Job Seekers. In Accordance with the merit, the Selection Board picks the suitable Candidates by Conducting Selection Test. NNPPHEDAssam.Org invites applications from the eligible candidates to recruit in the following posts. Total vacancy is 12 Posts. Require Age- Candidates age Should be As Per Rules. Age Relaxation is Applicable for Reserved Candidates. Educational Qualification- Candidates should have M.com/ MBA (Finance) CA/ICWA or equivalent with minimum 3 years relevant working experience. Educational Qualification- Master degree in Engineering, Social science, Environmental Science with 3 years professional development experience. Educational Qualification- Graduate in any stream from a recognized Institute with minimum 1 years relevant qualification in office Administration/ fill Management/ Office correspondence etc. Process of Application- Candidate may Apply in Prescribed Application Format & Send it with All Necessary Documents like Attested Copies of Certificates, Educational Certificates, Date of Birth Proof & Experience Certificates (If Have) to the following address. Last Date to Apply- Last Date 15.07.2017. Stages of Examination- Candidates Selection will be Based on their Performance in Written Test & Interview. I have shared all the important knowledge for the upcoming Assam PHED Recruitment here. 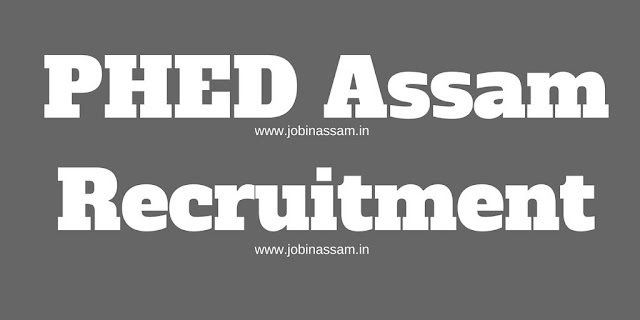 For more about AssamCareer jobs click here. I will help you as much as I can. This is completely free service for you. These posts will be a good job for you if you are eligible for the post mentioned above, apply before the last date. Monthely pay for the NNPPHEDAssam.Org job is also good.